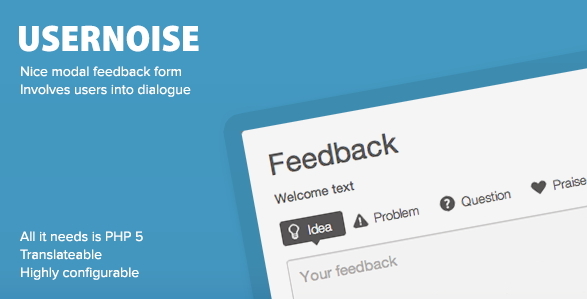 Usernoise is a simple script for receiving a feedback using a modal window and involve users into discussion. You will receive an email notification every time someone leaves a feedback on your site, and will be able to answer by just clicking “reply” thus involving your visitors into dialogue. So, the workflow looks the next way: User visits your site and openas a window by clicking Feedback tab. Then fills the form and clicks “Submit”. A notification is sent to your email (gmail accounts are recommended, but other emails work fine too). You can click “reply” in your email client software to reply to the feedback sent. Voila! Your visitor will receive your email directly. If you are running on WordPress and are looking for more powerful feedback solution, you may want to consider using Usernoise Pro for WordPress.